When you want to go on a trail you know that a suitable pair of hiking boots is important. Not only the comfort they provide matters but also how light they are, how well the outsole grips on different surfaces, if the boots are waterproof or if they have good ventilation to let your feet stay dry and cool. If you are looking for hiking gifts for your passionate friends or you wonder what hiking gadgets to add next to your list of items, here is a selection that can inspire you. This model from Columbia prides with being waterproof, it’s made of both leather and synthetic materials, and it has a breathable mesh tongue. The boots are lightweight and comfortable, which is a critical aspect when hiking. They are also adequate for both hot and cold weather, and they support and protect the feet. Being so rugged, they are a bit stiff at first, so wearing them too much will cause too much rubbing and create discomfort. After a couple of wearings they should get better. Because they are so light and comfortable, the wearer can use them almost daily if he or she works outside. The 2 Vent, Mid Hiking Boots from Merrell will not keep your feet dry in wet conditions — but they will keep them ventilated. They are thus suitable for warm weather. The boots are also more comfortable than previous versions, with the advantage of being able to stretch correctly to fit the foot. The high-top design provides support, and there is room inside if one wants to add more cushioning. Because they are hiking boots, the sizes should be chosen taking into consideration a thicker insulation, like an extra pair of socks. So, finding the right size is a bit difficult. These boots are created for women, so they are not only lightweight but also good looking. They are well-built and give excellent support. The sole has different tread zones for traction in different weather conditions, and it helps on uneven ground as well. As usual, your feet will need to adapt to them at first. They seem to hold up very well in snow, and you will not have your feet feeling cold, but they are not the best at being waterproof. The boots are a bit narrow, and they run a bit small, so do measure your feet carefully beforehand. This waterproof boot from Timberland is made of leather, so it will take you on your favorite trails, on different terrain, but will also look good with jeans and a tee. Its outsole made of rubber provides excellent traction. The footbed is perforated so that it leeks away moisture to keep the foot dry and cold. As these boots are leather, they have to be maintained. If they are wet after a day of intense walking, it would be advisable to let them air dry instead of using alternative methods to achieve the result. The insoles may also need to be changed, depending on preferences. Waterproofing is also a feature of the Hi-Tec Men’s Bandera hiking boots. They are a good solution for trailblazing, bouldering or campfires. The carbon rubber outsole allows for traction in all directions. These features ensure they are good for snow; however, they are not very well insulated. You might want to replace the shoelaces if you want something more durable, but other than that, the construction is very durable. Please keep in mind that they are made for hiking and not everyday use at work. It is better if they are not worn too much, so the waterproofing aspect is kept. If you are looking for a pair of hiking boots for your child, these Merrell ones can be an option. They are waterproof, too, but not in waters that are too deep, so passing through a river will make your feet wet. The insoles are also removable and can be washed with no issues. They are very comfortable, with air cushioning insoles and they also keep the toes protected well. The mesh makes the boots breathable, so they are favorable for the warm weather. The laces, however, are a bit too short and the kids might have issues with tying them. This waterproof pair of boots for women from KEEN is comfortable even from the first wearing. You need to consider buying half a size up as they tend to be shorter than anticipated. They hold up to steep and rough terrain and also have a large toe section and provide excellent support. If you get the right size they will cause no blisters, and they will most likely need no breaking so the foot will accommodate them from the start. Unlike other models out there, these boots are made specifically for hiking, so you won’t be able to utilize them for your regular work or chores. Are you an outdoor enthusiast? Do you feel that itch to lace up your hiking boots, and go exploring new paths into the wild? You start packing your backpack, and you fill it in with all the things you need, and suddenly your happiness vanishes because you remember you don’t have a pair of good hiking boots. You may not have the time to start going from store to store in search of the best boots for hiking, and when you do find a store that has boots for sale, you do not know what to buy.Too many types, different models – all these could prove overwhelming for a regular person who just needs a pair of decent boots to go hiking. If you have a friend or your significant other is into hiking, and you want to surprise them with a present to remind them how important they are to you, a pair of hiking boots could be a great gift for hikers. 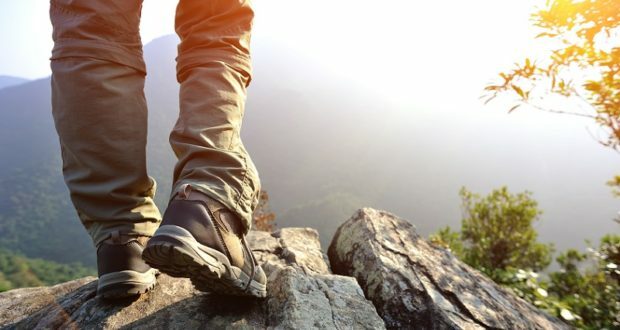 Luckily for you, we did a little research, and we found the best hiking boots for you based on your needs and your tastes. Choosing the right type of boots can prove a challenging task, especially if you don’t know exactly what you’re looking for. Keep in mind that these are mandatory for any hike or nature work, so you should pay more attention in finding the best pair to suit your needs. The most important thing when buying quality boots for hiking is the fabric. You will have to decide whether you want a leather or a regular pair, made from additional fabrics. Even if the design is the same, both have advantages and disadvantages. While a pair of leather boots can last you for years if you take care of them, they are usually heavier than the ones made from additional fabrics. The fabric pairs feel more like your feet are in trainers when you take them off from the box.The stiffness of leather replacement shoes will vanish in time so, the more you wear them, the more fit for your shape will be. Thus, we suggest choosing carefully. Leather shoes will last you longer but will be heavier and rather rough. On the other side, fabric shoes are usually cheaper and can provide good running performances, but only for a short period of time. After all, it only depends on how much you are willing to invest in your hiking gear. Before buying good hiking boots, you must ask yourself if you are someone that hikes all the time, regardless of the weather and season. Or you just love hiking in summer. If you go hiking, regardless of the season or weather, it is a must to have a pair of hiking boots that are high-cut boots. This type of boots is warmer and are offering better support for your ankle, being a little bit taller than the lower cut boots that are fit for summer trips. If you only go on hiking in the summer, you will need a low-cut pair of hiking boots. This type of boots can be easily worn in the city, so they are more versatile. If you don’t have the right pair of boots, you may risk injuring yourself. It is crucial to have the perfect size for the boots. Even if you have the best boots for hiking, you must try them with proper hiking socks, so you can wiggle your toes, and not feel any tightness around your heels. The cap should not press over your feet, and, definitely, you should tighten your boots too much as your feet must be comfortable in them. Even if you go on hiking in a canyon or the mountains, you should always think about protecting your toes. You should look for a pair of boots that has toe cap, preferably made of rubber, that will absorb the impact. If you enjoy winter hiking, you should check the underfoot traction – you will require a pair of quality boots for hiking with a winter traction system. It is highly important to have steel carbide studs integrated directly into the sole. This kind of sole will provide an excellent traction underfoot when walking on snow or ice. If you hike only in the summer, your hiking boots should offer you the possibility to go uphill, downhill, and side-hilling. Even if the trail is dry or it’s muddy due to the rain you should not slip, having a sole that was specially made for this kind of terrain. Nobody wants to go on a hiking trip, and their feet wet because of the rain. Thus, it is crucial to buy a pair of boots that are waterproof and not just water resistant. 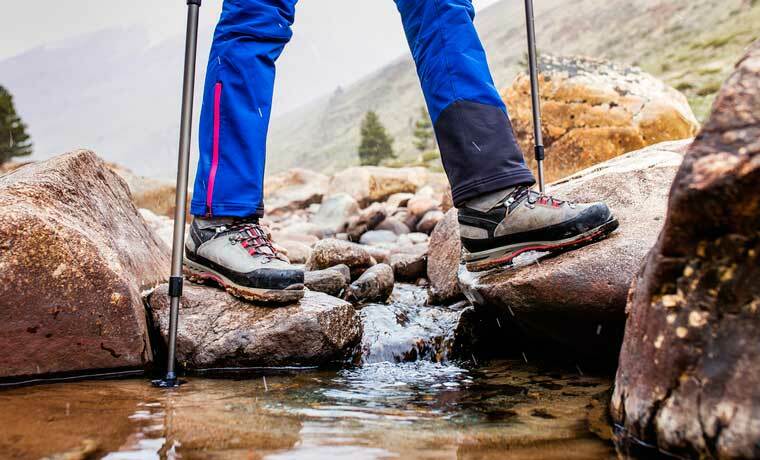 If your hiking boots are not 100% waterproof, your feet will get wet, which may cause further health problems if you don’t pay too much attention. You must pay attention to the fact that a waterproof hiking boot will run warmer in hot weather than a non-waterproof pair. All the hiking boots reviews suggest buying a pair of boots with a ventilation system, so your feet won’t overheat when wearing them in the summer. If you love hiking in a desert zone, well, having a pair of boots with a nylon mesh instead of leather boots could prove like a wise decision. With a nylon mesh, your feet can breathe, and the moisture will disappear, and the interior of the boot is quick to dry. The trend is all about the lighter materials that offer support, protection, and you can simply carry them in your backpack.